The Library of Technocrats Institute of Technology is fully Classified and Automated. It is an invaluable resource for students, researchers and faculties of Engineering (undergraduates & M.Tech. ), M.B.A. and M.C.A. The library has over the years built a robust collection of over 48,000 books, more than 200 bound volumes of journals, about 150 print journals and more than 425 online journals and many other resources like thesis, student's project reports, CDs, videos and news papers. The library, spread over 6950 sq. ft., also provides access to the best of engineering and management related digital resources through its subscription to various databases consisting of scholarly and industry relevant content. The library has set up network to provide various course related information to the users. E-journals of various international publishers like IEEE, ASME, Springer, McGraw Hill, Bentham, ASTM, ASCE, Elsevier science direct, Emerald, RMIT, EBSCO, JGATE, JSMS etc. NPTEL (National Programme on Technology Enhanced Learning) Video lectures of eminent Professors of IIT, Chennai. 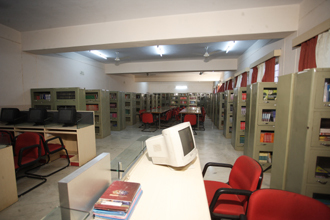 E-library with LAN and Internet facility. Valuable CDs (Software and E-media). Library Automation through Libsys Software. Generally speaking, the library aims for providing the necessary information and making them available to all the beneficiaries in the appropriate time as well as it seeks affording and organizing balanced sets of books and other information sources to go hand to hand the university curriculum and presenting to the researchers and beneficiaries using the both traditional and modern (electronic) getting back methods. Providing, organizing and making available for use a modern and rich set of specialized information sources. Providing the new important information within the users in the institute. Providing appropriate information retrieval system. Contributing in publishing, keeping, organizing and getting back the copies made in the institute. Cooperating with other specialized libraries like IIT Delhi, RGPV, National Chemical Library (NCL), Library Poona, National Library Kolkata, TERI etc..
To teach the students and the staff in the use of the library and to develop their self study skills. To maintain effective links with all the College staff, let them aware and respond to the challenges in education and approaches to learning. To collect, cultivate, preserve and endow the treasures of knowledge, heritage and culture in general without any caste and creed. ​To maintain and operate an infrastructure that allows, among other things, suitable study, documentation, storage, preservation, presentation and research conditions. Internet facilities can be accessed by faculty members and students. They can download and e-mail materials related to their study. There is separate section provided for Digital Library. 20 networked computers are there in the library. In these sections, faculty members and students can access online journals and avail internet facilities. They can refer e-Books and e-Journals and download the reading materials and can also send or receive e-mail. Multimedia facilities are also available in the Digital Library. NPTEL Lectures in Video Format of eminent professors of IIT are available on separate system and students and faculty members can refer it any time. Central Library offers access to online e-journals, e-books, e-database, e-lecture videos and open source software with useful links. User can freely access the Full Text or Abstracts in a flexible and easy manner to use for their day to day study. 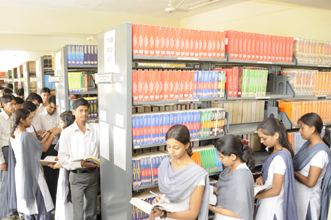 The facility of Book Bank is also available and has 12000 volumes of important and useful books in a separate hall. Self-Operated photocopying machine is available in the library. Use of this machine is against username and password. The rate of photocopy is Rs. 1/- per page. Under the library extension service we call the eminent and renowned professors, scientists, industrialists etc. time to time and organise their lectures before the students and faculties. 8 ASTM (DL) ME, CSE, EX, EC, IT, Civil, Metallurgy, Instru. & Petro. 47,000 articles, 9 Imp. Engg. Journals 1400 ebooks & standards. 18 MASTERING LINUX PREMIUM ED. All the activities of the libraries i.e. Purchasing (Books, Periodicals, e-journals and other reading materials), time to time, the library guidelines are chalk out and modified by Library Committee. The Central Library is primarily meant for the faculty, research staff, students, and administrative staff of the Institute. These rules are framed to help and promote, rather than to constrain the use of library materials and services. In addition to above additional books are issued to meritorious students on special recommendation of Group Director. Faculty & Staff Members can borrow two books for full semester.